(i) Working Scientifically: STANSW Scientific Investigation Awards (Science Teachers’ Association of New South Wales). The Years 11-12 Working Scientifically awards are sponsored by Rowe Scientific Pty Ltd.
(ii) Working Technologically: ITE Innovation and Engineering Design (Institute of Technology Education). Three of the best innovative devices or applications in each age group. (iii) Working Mathematically: MANSW Working Mathematically Awards (Mathematical Association of NSW). Three of the projects in each age group that best incorporate the interrelated components of Working Mathematically in their investigation or innovation. Cash prizes of $100 for projects that were not prizewinners but have the potential to develop into top-level projects. 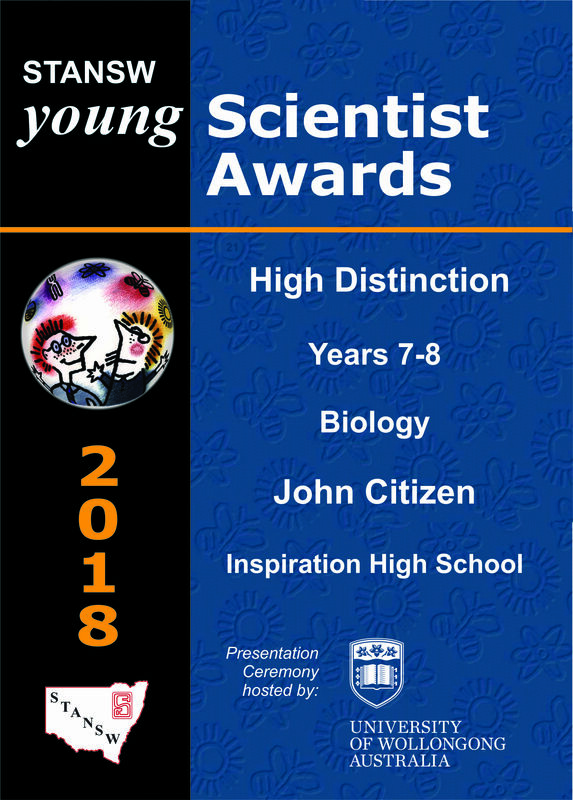 2019 Young Scientist of the Year Award $2000 award to the student who submits the most outstanding project overall. 2020 Broadcom MASTERS International Delegate Subject to funding from our major sponsors we wish to select one student from Years 7-8 to travel to Anaheim, California, to the Broadcom MASTERS International in May 2020. The selected student must be a prizewinner, a good communicator and be born after 17th May 2005. 2020 Broadcom MASTERS International Honorary Mention One student with a top entry from Years 7-8 will be selected as a reserve for the Broadcom MASTERS International delegate. The selected student, who will receive $100 in cash, must also be a prizewinner, a good communicator and be born after 17th May 2005. Most prizewinners and a selected number of highly commended entries will be invited to submit their entries into the national 2020 BHP Billiton Science and Engineering Awards. Twenty-six finalists from across the country will be selected to attend an all-expenses paid trip to attend a five day science camp in Melbourne, in February 2020.